Kennedy Library’s central location is perfect for promoting student organizations, events, signups, and other campus happenings. Below are a number of ways we are happy to help our campus community share information. The bulletin boards are cleared off weekly to ensure that all information is current. To post for longer than one week see the front desk in Library Administration (Library, Room 204). Flyers will be affixed with approval stickers, which include a “remove after” date. All flyers will be taken down after the date on their stickers to create space for new, current information. Signage requiring longer than one week posting shall be approved by Library Administrative Services in Room 204. If approved, Library Administrative Services will provide approval stickers noting the date for removal. In general, approval requires the event to be directly related to Cal Poly such as a club activity, campus event, department event, or benefit to the student body as a whole. See a map of the bulletin board locations and review policies. The library reserves the right to withhold approval for posting longer than a week for reasons including but not limited to: time of quarter, number of requests received, number of requests per group received, etc. PLEASE NOTE: Flyers and Posters are allowed ONLY on bulletin boards. Any flyers found on walls, elevators, bathroom stalls, mirrors, windows, etc. will be removed, all previously approved postings on existing bulletin boards will also be removed, and prohibited postings may result in a future ban to the organization for future postings in the library. The organization may be held responsible for any damage to the campus facilities from incorrectly posted signage. This display case table and enclosed bulletin board (located on the second floor landing of the library’s main staircase) may be reserved to promote campus organizations, activities, and events. Any individual campus organization may reserve the space once per quarter to ensure diversity in content. To check display case reservations or discuss using the display case or bulletin board, please contact Library Administration in the Library, room 204, via phone at (805) 756-2345 or via email to ude.yloplacnull@gniludehcs-bil. Kennedy Library’s central location is perfect for promoting student organizations, events, signups, and other campus happenings. In order to help support the promotion of campus activities, the Front Plaza of the Kennedy Library is available for reservations on a first come, first served basis. Kennedy Library’s Front Plaza Promotions Policy follows CAP 142 Approved And Priority Uses Of University Property, Facilities And Services. University Scheduling coordinates usage requests to ensure that facilities are being used within CSU and campus policies and guidelines. All requests for the Front Plaza must be received a minimum of 10 business days prior to the date of event for consideration. Student Clubs and Greek Life: Initiate your request through the UU Epicenter e-Plan. Access to e-plan is available via the portal. Contact 805-756-5550 for help or questions. No electricity can be provided for the space by the library. No extension cords from the building or grounds can be used unless approved by campus facilities. If you require electricity, please indicate that in your request. All food and beverages MUST be approved by the Environmental Health and Safety department prior to approval of event. Events will not be approved by library administration without EHS approval. The display of a Temporary Food Permit is required at all times during your event. Campus staff may ask to see this form at any time. Groups must provide their own tables. The Library DOES NOT provide tables in the space. Please see the approved table location map provided on the other side. Entrances to the library cannot be blocked for occupant safety and adherence to fire and building codes. DO NOT setup under the eaves of the building regardless of rain, heat, wind, or any other inclement weather. Groups are responsible for their own setup and takedown. The library does not provide any setup or takedown assistance. No selling of merchandise is permitted. This includes scantrons, blue books, club gear, clothing, etc. Permission for the use of the space may be revoked at any time if any violations to this policy occur. 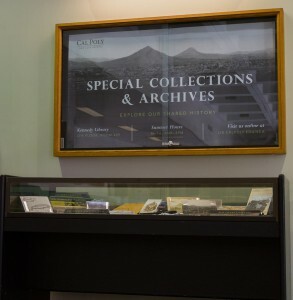 All digital signage content is related to Kennedy Library collections, services, and events. The library does not run content from other programs or departments at this time, unless directly partnering with those departments for the specific event being promoted. Sunny Friday! It's 4:01pm right now.